When looking around potential properties, the room that people tend to look over a little lightly is the living room. It's true that the kitchen and bathroom are the biggest selling points for renovated home, but the living room is often where you spend the majority of your time when you are actually living there. It's one to pay a bit more attention on viewings, so, here's three key points to ask yourself on the way around. 1. Does the layout match my habits? In your current home, are you a secret chef or do you flop down in front of the TV every night after work with a cuppa? I used go straight to my bedroom when I lived at home, using it as an alternative living room - my bed was the sofa and my desk was sometimes the dining room. Considering your day to day activities will help you decide what key features you need in your new living room. Think about how you relax and how often you like entertaining. Being an only child, I knew that when I had my own home I wanted a space where everyone was invited whenever they were free. I wanted people to come and go as they pleased, which meant I needed a reasonable space for entertaining that was also homely and relaxing. For instance you love to cook and entertain, is it important to you to be able to socialise and cook at the same time? If so, maybe an open plan kitchen/diner would suit you best. Or, can you not stand the smell of cooking across the house? In which case, you could look to have the kitchen as a separate room. 2. Does my furniture fit into the space? This point might seem pretty obvious, but it's also very important! Being a first time buyer might mean you are buying new furniture or inheriting furniture from family and friends. Sofa's are expensive things and moving them can be tricky especially if they don't break apart into modular pieces so it's worth checking the route that it would have to take. Even if you buy a new sofa, it's worth finding out how many piece it breaks up into and the sizes of the pieces to ensure they fit! Some properties have narrow corridors or doorways that are difficult to maneuver around, so keep an eye out for this on viewings! The same thing goes for super large TV's, dining furniture and anything else large! 3. Am I happy with the privacy and natural light of the room? Something that isn't always considered when looking at property is the privacy of the rooms you spend the most time in, or get dressed in. The living room is often at the front of the house looking out on a road, which normally means anyone walking past can see right in while you sit watching tv. If you don't mind that, then ace! But if you don't like feeling like you are a zoo animal you might decide to put up curtains, blinds or shutters but this often means you lose light in the room. Keep an eye out for how the current owners retain their privacy, as they might have opened the curtains to let lots of light into the rooms even though they don't normally live like this. Try turning lights off in daytime viewings to see how the house feels without synthetic light, as dark and gloomy homes can be a bit depressing if they are unexpected and so a big electricity bill and carbon footprint start to build up! All of Number One's before pictures of the living room are dotted through this post. When I first saw the living room I didn't think of any of the above points, which meant I was anxious about getting a sofa in, although it's all worked out ok! Luckily, the living room doesn't face the room so my privacy is safe and there is just enough space to house our friends or family but we won't be having any large sit down meals anytime soon! I'd love to hear any other points about what makes a great living room on the Cushion Fort Facebook Page! I'd also love to see your renovation befores and any ideas you have for ours! 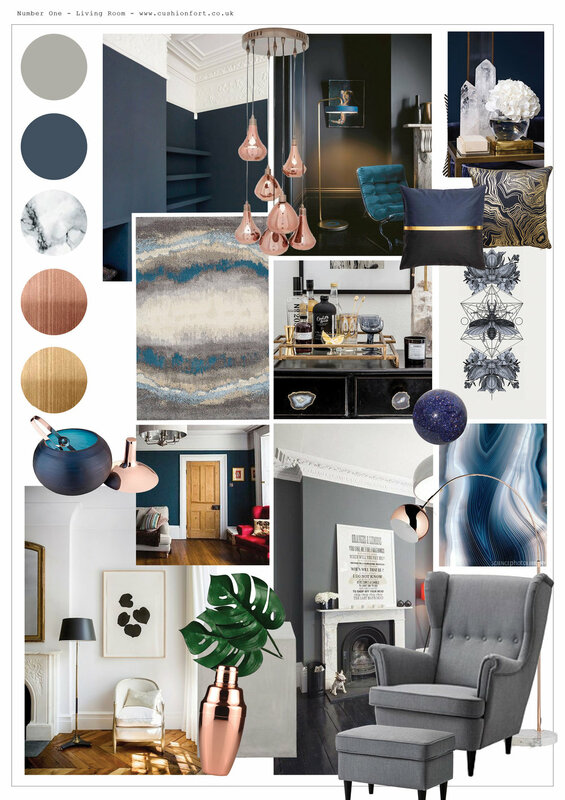 I'll leave you with the moodboard I put together for the space, can't wait to see what you think!